Guide to Home Canning, Freezing, & Dehydration. The Ball Blue Book is a comprehensive reference on the subjects of Home Canning, Freezing, & Dehydration. From the very basics to advanced techniques on food preservation this book is sure to please everyone. Instructions, How-To's, Recipes, Lists, Charts, and much more. There is no other book like the Ball Blue Book, the ultimate guide book for fresh preserving. 200 pages with over 500 recipes including over 75 new recipes. This is the classic American guide to keeping fresh tasting food on hand. Brand new edition with a 2014 copyright date. This soft back book guides you with step-by-step instructions through the principals of canning while ensuring the quality of food. Includes pre-canning planning and altitude adjustments. Guides you through canning items with explanations and how they should be used. Includes water bath canning, pressure canning, dehydration and re-hydration, vacuum packing, and freezing. This book discusses high and low acidic foods, pickled foods, spreads, meats, fish, fruits, and vegetables. Includes step-by-step guides on canning tomatoes, green beans, and more with photos to guide you through the entire process. Also found in the Ball Blue Book are special diets, problem solving, and solutions to the modern day busy lifestyle. Easy to follow recipes for the beginner and the expert alike. 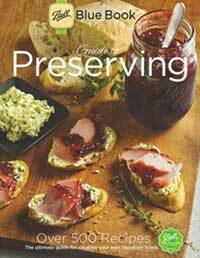 This is a must have for every preserving kitchen.